A regular feature where I look ahead to what I have on order from the releases of the week. This is obviously not a definitive release schedule - for that, try Diamond for the list of next weeks releases and this weeks releases (updated every monday). Last issue was a bit (*sigh*) of a let-down really. 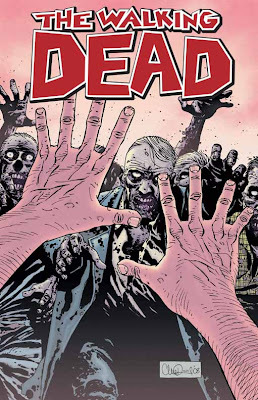 A bit forgettable, not long enough for a 50th issue and didnt really take the story anywhere. It was still better than most anything else that week (or that month), but that is not the point. Standards are high with 'The Walking Dead', and when they dip a little, especially combined with the slipped shipping dates, it can make it a bit of a disappointing experience. Still, I have high hopes for this issue - bring back the rest of the cast!!! Well, where do you go after the final pages of #5? I cannot imagine. For anyone thinking of jumping on at this point, I would suggest they go back and investigate from issue 1 - this is NOT the sort of tale you can just dip in and out of. The situation that some of the main characters find themselves in as of the end of #5 are so dire, so life threatening and so truly horrific that it really would make no sense to newcomers. It doesn't make that much sense to me either, and I have been reading the thing since #1. Probably the most intriguing release of the week, and will more than likely be the most controversial. all look promising - all in all this is looking the best week in several for titles. Which is good, beacuse the weather here is rubbish and there seems to be no let up.